I love to learn about different cultures and love meeting new people. I have lived in Venice for 4 years now and I know a lot of nice places to visit, interesting facts and curiosities. I have traveled a lot, I am passionate about learning new things and discovering unique places in each city I visit. This list is a mix of some of my favorite off-the-beaten track landmarks and a few handpicked, must-see places. 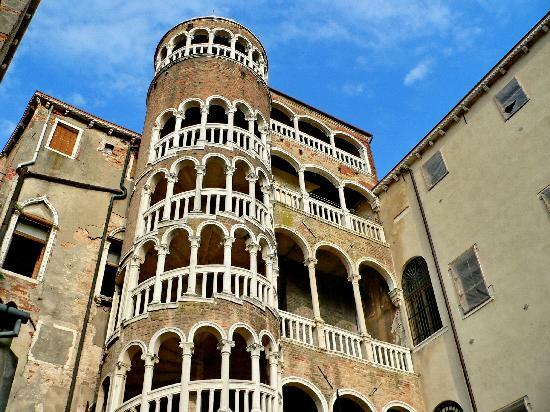 Search for these spots, and other secrets tucked around the city, to discover your own unique Venice. The best way to experience Venice is to pick a direction and wander. Getting "lost" allows you to stumble upon the city's many secrets. There are some street markets around Venice where you can join the locals to buy fresh fruits and vegetables. Try those in Strada Nova, Rialto and Campo Santa Margherita. 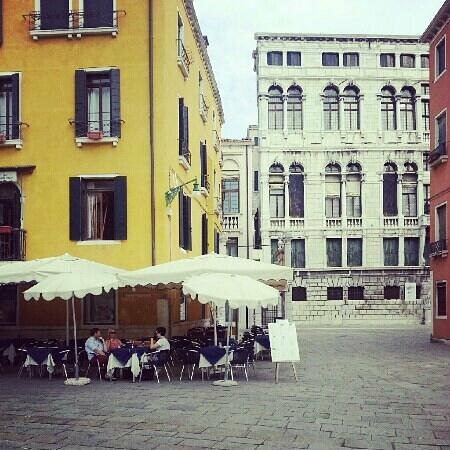 Most restaurants in Venice close in the afternoon and re-open between 7 and 8 pm for dinner. To explore the city easily on foot, put your map away and follow the yellow signs (like the ones that say “Per S. Marco” or “Per Rialto”). 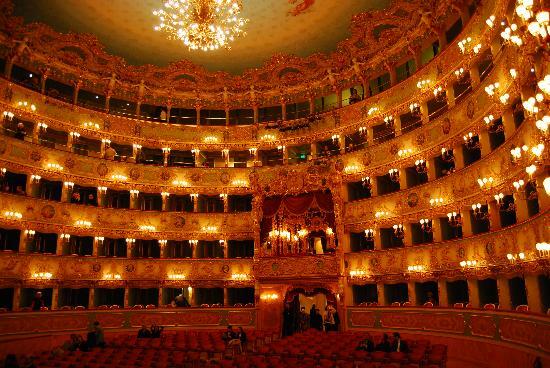 The world-famous Teatro La Fenice burnt down twice - in 1836 and then again in 1996 - before it was eventually reconstructed in 2004, like a phoenix rising from the ashes, as its Italian name suggests. Even if you are not an opera fan, don’t miss taking a tour of the interior. The theater’s magnificent beauty, complete with ornately decorated halls and golden chandeliers, is a truly awesome experience. To see a performance here, be sure to book your tickets well in advance on the theater website. The theater is typically open to visitors during the daytime, and also offers guided tours. Check the website before visiting, as the hours sometimes vary. For an evening performance, it is advisable to dress elegantly. 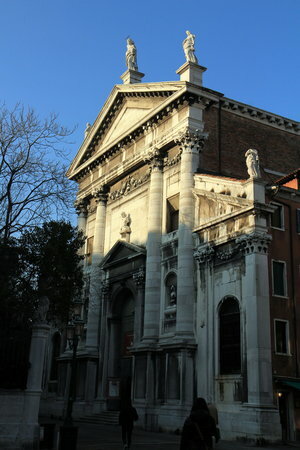 Hidden off a quiet canal in the Cannaregio district, this lovely marble church was built with locally raised money to house a statue of the Virgin Mary that was known to work miracles (“Santa Maria dei Miracoli” means "St. Mary of Miracles." She still stands near the altar. The best place to eat typical Venetian food in the area is Osteria Al Portego in Calle della Malvasia, one of my favorite spots to enjoy cicchetti. Remember to respect traditions and be sure that your shoulders are covered when you enter the church. 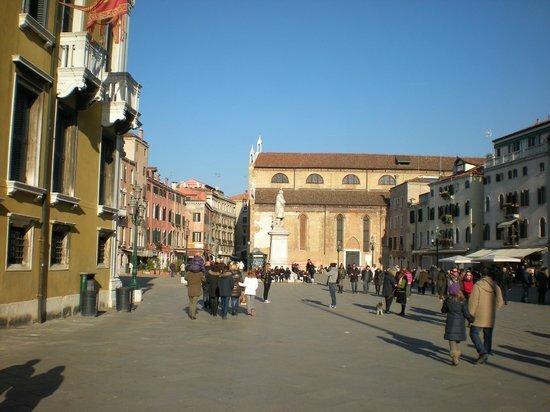 One of the most beautiful and spacious squares in Venice, Campo Santo Stefano is a great spot to observe the city. I love to spend a relaxing day people watching over a caffè latte on one of the many café patios. 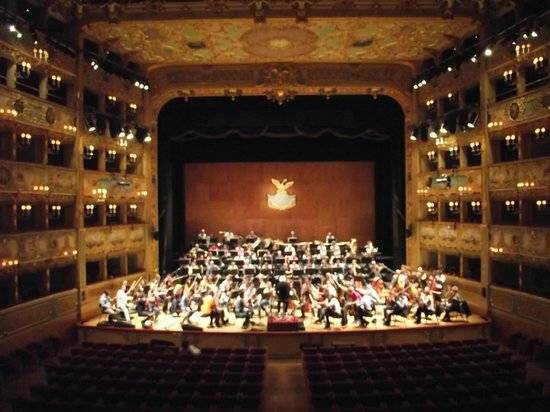 Also worth observing are the many beautiful palaces around: the breathtaking Gothic Church of Santo Stefano, the spectacular Palazzo Loredan, the elegant Marcello Conservatorium of Music and the magnificent Chiesa di San Vidal, which often hosts classical events and concerts. My favorite place for ice cream, coffee, light snacks and drinks is Gelateria Paolin (try their special dessert: gianduiotto chocolate with whipped cream). Very close to Campo Santo Stefano is a tiny hidden courtyard. 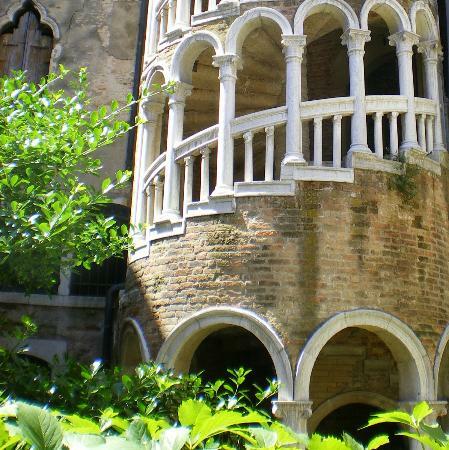 In that courtyard is an elegant spiral staircase that reflects the transition from Gothic architecture to the Renaissance style. 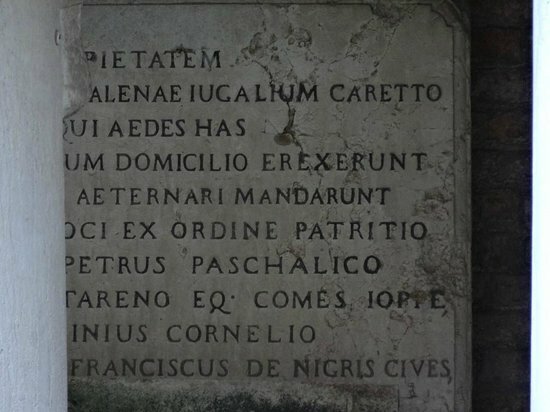 If you love finding random treasures, Scala Contarini del Bovolo is definitely worth looking for. At the moment it, is only possible to view the staircase from outside due to the restoration works in progress. 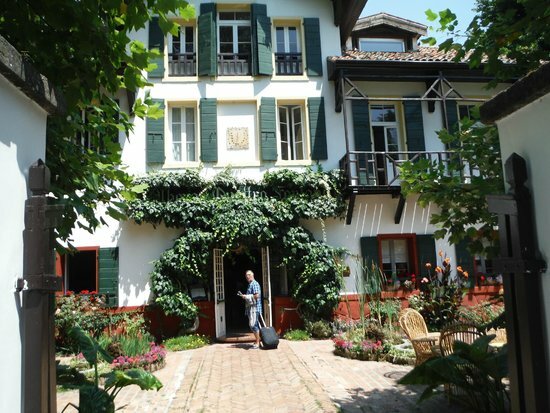 For a delightful meal, try the nearby Ai Mercanti restaurant. A 12km island dividing the lagoon and the Adriatic Sea, Lido di Venezia a perfect place for a quiet afternoon walk or a day at the beach. 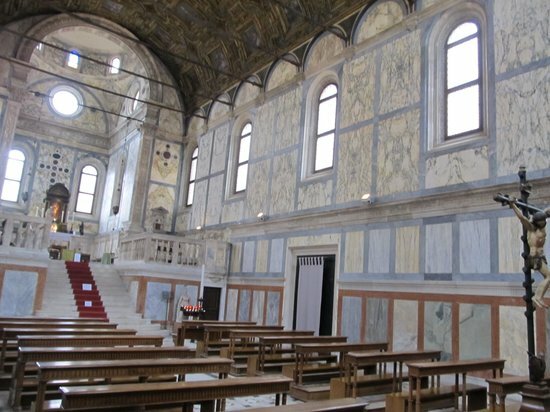 Undiscovered, and not often frequented by tourists, history lovers will be pleased to discover elegant villas and beautiful churches, like Chiesa di San Nicolò, which houses St. Nicholas’ relics. 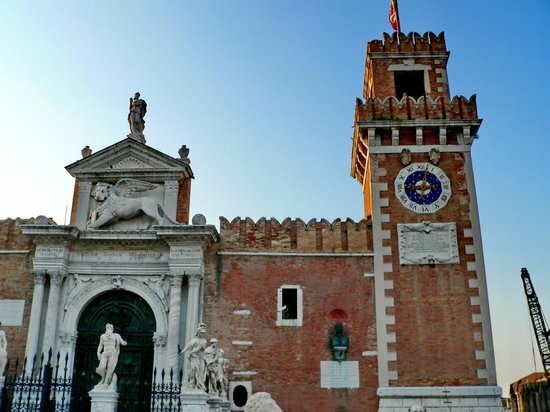 Nearby, you catch a helicopter tour around Venice from the Nicelli Airport. Take water bus #6 to easily reach Lido. 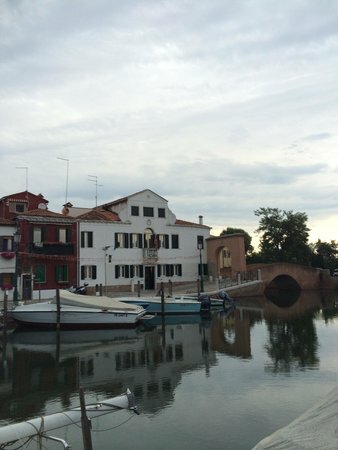 This little boatyard near Ponte di San Trovaso is the oldest place in Venice where gondolas are built and repaired. 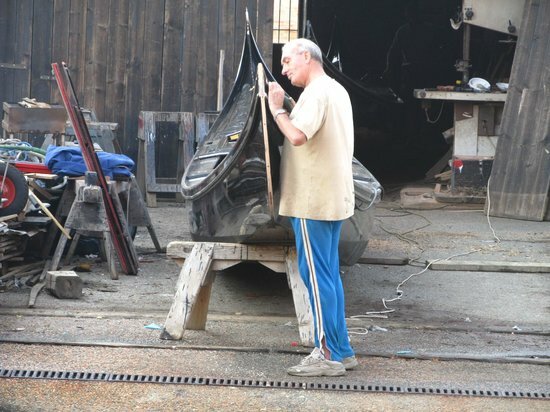 Building a gondola takes about 280 wooden pieces, 8 different kinds of wood, and up to 2 years of work, and you can catch a glimpse the process at Squero di San Trovaso. 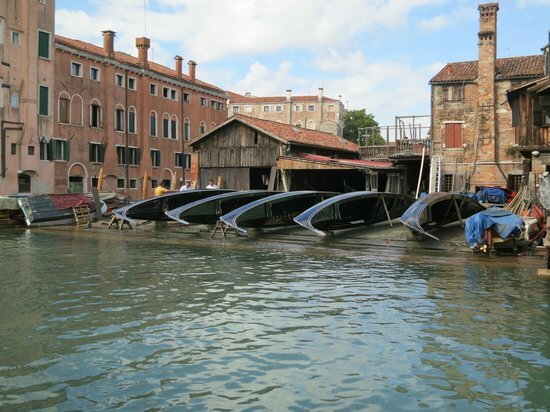 For an affordable gondola experience, take a “traghetto” (ferry-gondola) to cross the Grand Canal from one side to the other. The cost is 2 euros for tourists. The best way to observe gondola masters at work is from the opposite side of the canal. Situated next to the Ponte di San Trovaso in the Dorsoduro district, this small enoteca is always packed with locals and tourists, and for good reason. Al Bottegone is my favorite place to buy bottled wine, as most of the great wines in its wide selection cost around 6-7 euro a bottle. 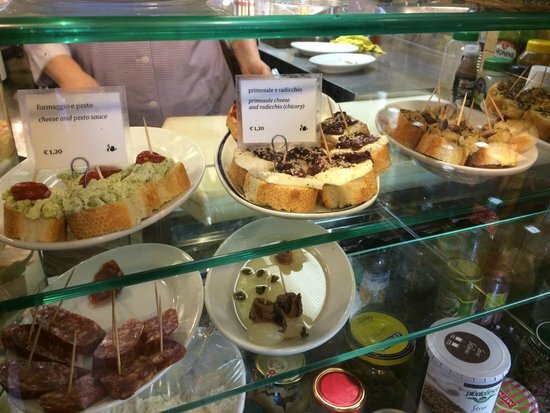 The cicchetti here are also excellent and cheap. Try the delicious “baccalà mantecato” (creamed dried cod), “polipo” (squid),”tonno e porri” (tuna and leeks). 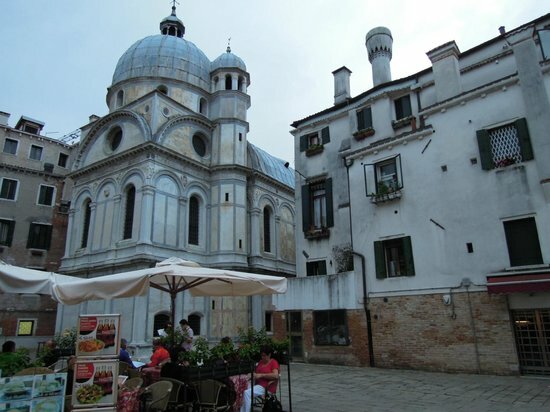 The Castello district is a perfect place to experience the typical Venetian atmosphere. 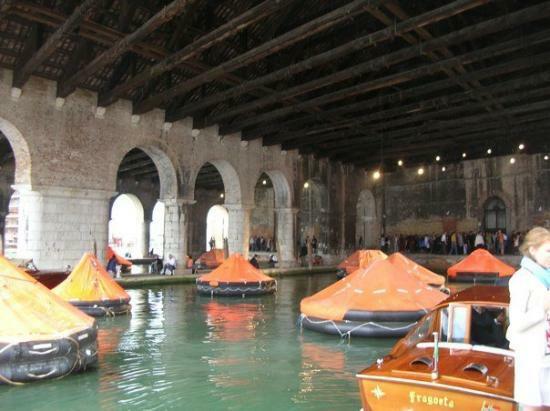 It is at Arsenale that shipbuilding took place in the 13th century, when Venice was an important maritime empire. Today, this dockyard complex is mainly known for its Naval History Museum, where you can admire weapons, ship models, illustrations and paintings describing Venetian shipbuilding techniques. 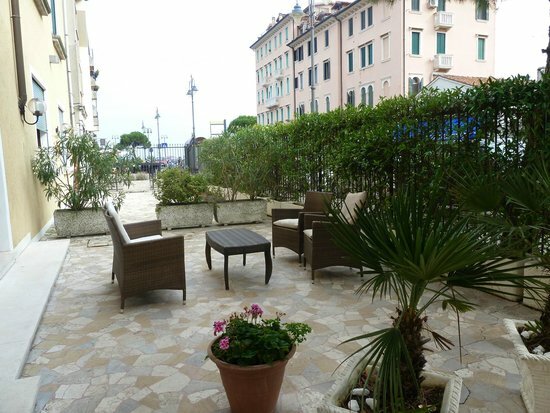 Have lunch at the nearby Trattoria alla Rampa (Via Garibaldi) or Trattoria al Diporto (Sant’Elena). 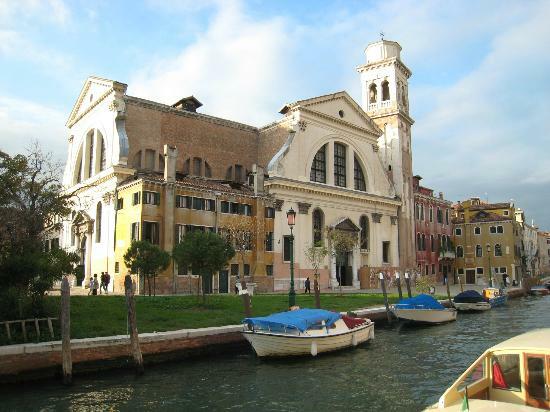 Nearby, you will also find the stunning Greek Orthodox Church of San Giorgio dei Greci, as well as the largest park in Venice, Biennale Gardens. 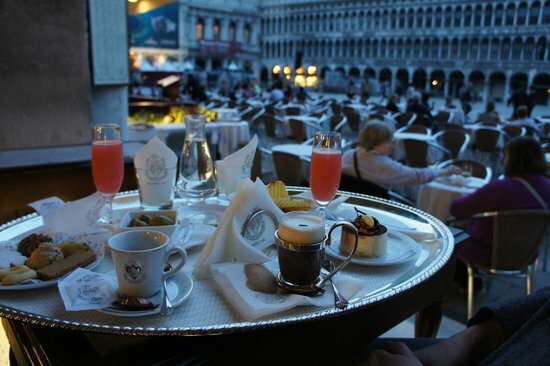 Centrally located in St. Mark's Square, this famous spot is one of the oldest operating coffee houses in Venice. 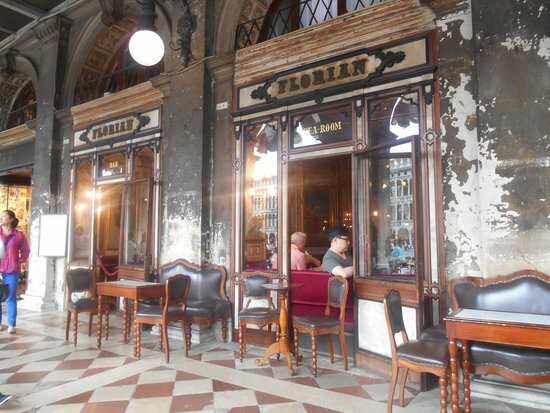 Caffe Florian's rich interior is peculiarly situated: the several lavishly decorated rooms, each with a view of the square, are all connected by one corridor. It's a luxe coffee experience to sit and draw inspiration just as Goldoni, Casanova or Byron did in their time. In summer season there are often live bands playing music on the terrace, in which case an additional charge might apply. There are lots of small islands around Venice, but San Giorgio Maggiore is a truly off-the-beaten-track gem. The highlight of the quiet island is the Church of San Giorgio Maggiore, a stunning work by Palladio. For those who love cultural events, the island has a Film Festival and an open-air Teatro Verde. Take the water bus #2 from St. Mark's Square to the island. 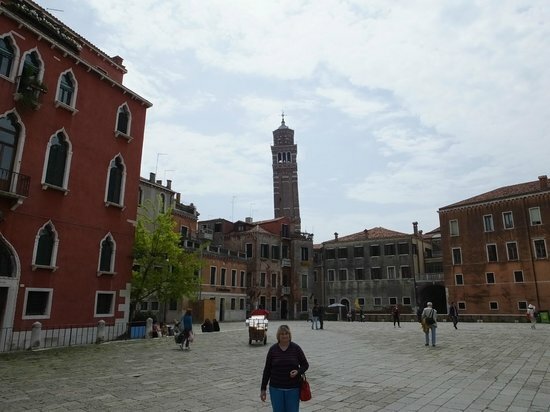 Visit the church's belfry for a breathtaking panoramic view of Venice.